This past Tuesday, I ran a post on Chicago&apos;s Bridge to Nowhere — the former "L" bridge crossing the West Side Metra tracks near Paulina and Carroll. Since then, I&apos;ve come across another photo which gives a clearer picture of how the bridge was once linked to our transit system. The view here is north across Lake Street, with The Bridge in the distance. 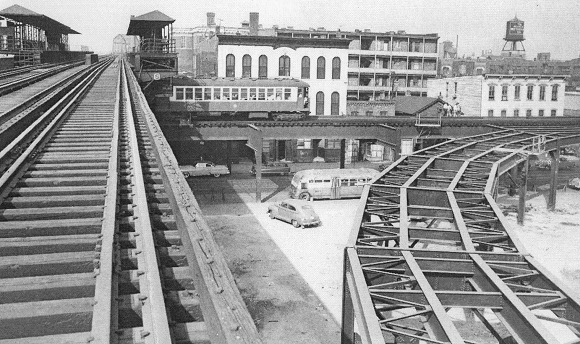 The track running north has been abandoned since the opening of the Milwaukee Avenue subway in 1951. However, at the right of the photo, we note that CTA is building a new connector track so that Douglas Park trains can access the Loop via Lake Street. Douglas Park trains used Lake Street until 1958. At that time they were rerouted down a ramp into the median of the Congress (Eisenhower) Expressway, through the subway, then out along the "L" to a terminal at Logan Square. CTA called this service the West-Northwest Line. It was later extended to O&apos;Hare Airport, and became known as the Blue Line. In 2006 CTA again routed trains from the onetime Douglas Park branch to the Loop via Lake Street, creating today&apos;s Pink Line.